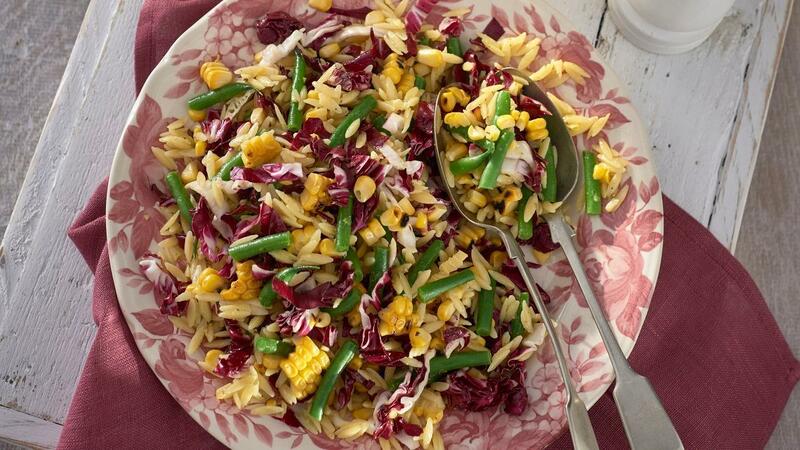 Try out this tasty summer salad recipe for chefs with hot sweet dressing, grilled corn and green beans. Boil the Orzo in salted water until al dente. Cool and toss in a little oil to stop it from sticking together. Cut the green beans into 2cm pieces. Blanch the green beans and refresh. Cut the Radicchio in half then chiffonade into fine strips. Store all ingredients in the fridge until ready to serve. Oil the Sweet corn cobs. Char grill the corn giving colour to all sides. Once cooled, cut off the kernels and store in the fridge for later. Whisk the COLMAN'S English Mustard, lemon juice and caster sugar together. Whilst whisking, drizzle in the sunflower oil until a thick dressing is formed. Place all the ingredients into a large bowl along with the dressing. Toss together and serve on a large platter.